Update (Jan 2010): The 2010 workshop is in full swing. This year we have 15 attendees each crafting their own mirrors. We've got one making a 4 1/2" refractor, one working on a Cassegrain secondary, another making an 8" flat, and several Newtonians ranging from 5" - 14 1/2". Make your own telescope mirror. Cure that cabin fever with the company of other astronomy enthusiasts as you grind your own mirror. The workshop is held at my home in Tolland, CT and runs from 9am to noon. Under the workshop concept you choose your own telescope mirror project and work on it at your own pace. This is not a class with a structured agenda and timetable. There is no cost for the workshop, however, you need to procure the necessary equipment and supplies on your own. The workshop provides workstations, a knife edge test bench, video tape clips showing various process, and me as mentor to guide you through with a real science approach and plenty of encouragement to complete your project so you will have a mirror you can be proud of. As you can see, projects other than primary parabolic mirrors for Newtonian telescopes are encouraged. If you ever wanted to tackle more compound systems, refractor objectives, or make your flats or secondary diagonals, please feel especially encouraged to come to the workshop. 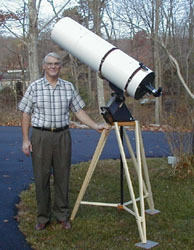 Hopefully by participating in this exciting workshop you will be able to learn how to make your own telescope mirror. By making your own telescope you will enjoy observing in new and wonderful ways with the thrill that what you see is being provided by an instrument that you crafted yourself. So whether you want to start a mirror, continue working on one that you started years ago, or finish one you were working but did not know how to get a good figure -- come to the workshop. Please contact me by e-mail at mirrorworkshop@mtbparker.com for more information and to reserve your spot. In addition, please reference the mirror workshop in your subject to avoid it being accidentally handled as spam.